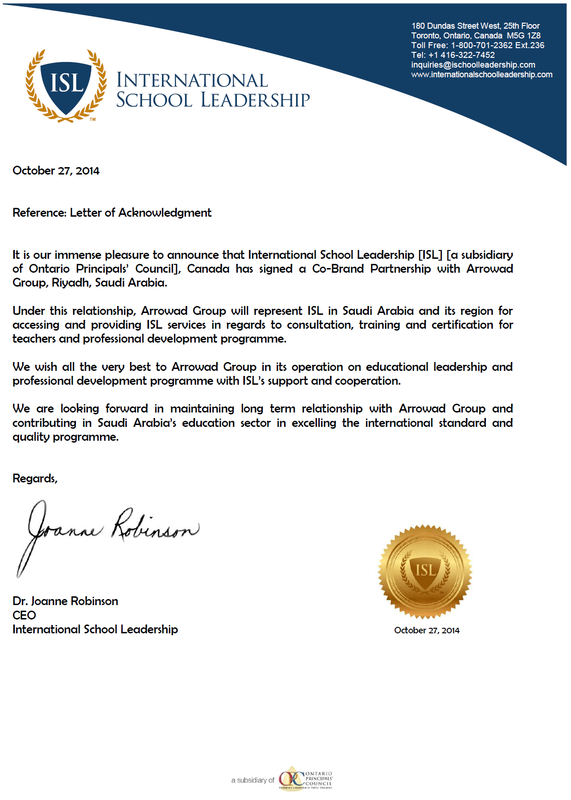 Arrowad Group signed an exclusive Co-Brand Partnership with International School Leadership (ISL), a subsidiary of Ontario Principals' Council, Canada. Under this relationship, Arrowad Group will be providing ISL services in regards to consultation, training and certification for teachers and professional development programs. ISL provides professional consulting services, training and certification programs to K-12 school and system leaders around the world. ISL has long experience in the GCC & MENA on educational leadership and professional development. ISL is a partner of Charles Stuart University (CSU), Australia which entitles ISL Certificate candidates to enroll in the Master of International Education (School Leadership). Local Ownership: ISL collaborates with local policy and practice leaders to ensure the training incorporates leading global practices for educational leadership while building on local knowledge and expertise. Participatory Development: The approach is inclusive and consultative; designed to ensure results and based on evolving client needs and requirements. Leading Principles and Practices of Adult Learning: The programs focus on the most effective techniques for learning and pulls from the latest trends and research. Enhanced Learning through Technology: To facilitate and promote advanced learning and sharing, technology is be integrated seamlessly. The Aramco project team in Arrowad Group visited King Abdullah Bin Abdulaziz International Center for the Arabic Language (KAICA), in Sunday 15 June 2013 at their current location in Imam University in Riyadh. Arrowad team consisted of Dr. Saad Al-Khalaf, Dr. Abdel-Elah Al-Ayyoub, Mr. Ahmed Almilaiki, Mr. Mohammed Gamal, and Mr. Faisal Alhuzaifi. KAICA team consisted of Dr. Abdullah Al-Washmi, Dr. Salem Alsamiri, and Dr. Ali Almouf. First, Arrowad Group presented the project “Reading and Knowledge Society”. KAICA team presented the center’s objectives and initiatives. The two teams are looking into new windows of collaboration and also spotting commonalities and possible synergies to boast the impact of their projects. King Abdulaziz Center World Cultural organized a workshop in collaboration with Arrowad Group in Monday 8 April 2014, Movenpick Hotel, Al Khobar. This is one of the a series of workshop being conducted in the framework of Reading and Knowledge Society, a national study on reading trends and patterns in Saudi.